Jacalyn was living in a home with at least a couple dozen other cats. The homeowner was taking in stray cats with the best of intentions but sterilizing the cats was not on her to-do list. When the lady passed away, the family turned all the cats loose. Naturally, this was upsetting for people living in the neighbourhood. Lucky for Jacalyn, she was trapped by a person working towards relocating and sterilizing as many of the cats as possible. When Jacalyn was brought to the veterinary clinic to be spayed, the vet determined she had given birth as little as twenty-four hours earlier. The kittens were located and even though the five of them had gone almost twenty-four hours without their mom, they survived. 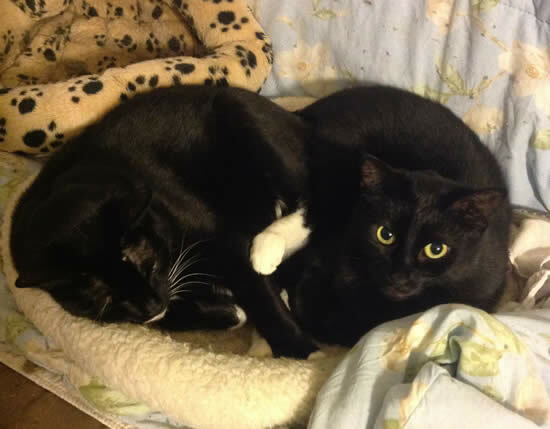 Because of hostilities in the neighbourhood, the little family was put into a PAW foster home. Jacalyn and Janny have not been apart since then. When Jacalyn was trapped, it was thought she was likely unsocialized to humans, like most of the cats from that home. But not so! She was completely tame. 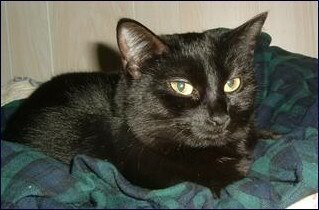 She is a calm, quiet little cat with an unassuming and affectionate personality. She goes about her business, but loves it when it's her turn for attention. And she'll get that attention by being your little shadow. She is great with other cats and dogs. She enjoys treats and canned food (the pop of a lid will bring her a-runnin'), loves to play and uses a scratching post to her best advantage -- usually to watch the goings-on in the yard. For nap-time, she prefers to sleep on your bed. It is difficult to capture the wonderful essence of a black cat in a photo. 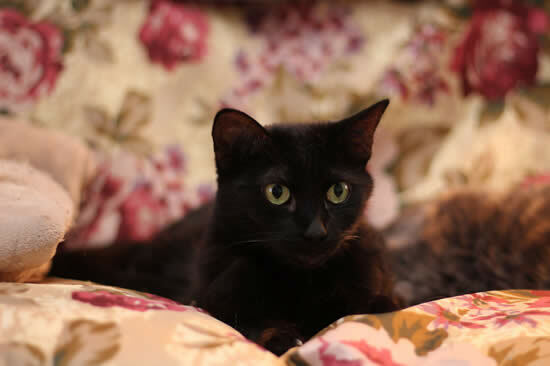 In person, you will see that Jacalyn has a beautiful, sleek, glossy coat and that she is very gentle and lady-like. In August, 2014, Jacalyn and Janny were moved to a new foster home. We were pleased to learn they adapted quickly, despite having spent seven years in the previous one! They continue to very much enjoy a relationship with their human, very willing to love the one they're with. Their integration with the resident cats in their new foster home was seamless. What good little cats! We hope they find a permanent home soon. Foster mom says Jacalyn's one of the sweetest cats she's ever fostered. Jacalyn has had two dentals done but she won't need another. The last one, in November, 2015, was a full mouth extraction due to dental disease. She recovered very quickly. Cats do just fine without any teeth - Jacalyn is the proof! She continues to love canned food (she'll generously finish off her roommates' meals too) and still enjoys crunchies.